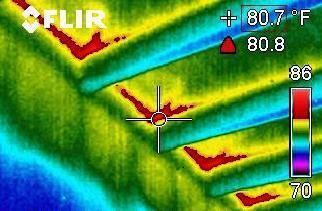 What does water intrusion have to do with an energy audit? If the water penetration in your property is the result of inadequate heating within your property, our energy assessment may find the source cause. Because Pro Energy Consultants use infrared thermography as part of the energy audit, we can ‘see’ more than the generic ‘clipboard’ audit performed by most energy programs and unprofessional energy auditors. For example, the picture below was taken during an actual home energy audit, and highlights issues between the wall and ceiling space. Even mild cases of ice damming that are not yet causing gutter damage could be causing hidden water intrusion behind your walls. Left untreated, this prolonged condition can lead to mold buildup, which can cause a variety of health concerns.